Curious about LG’s next flagship and when we can expect it to arrive on our shores? According to those close to the matter, the Optimus G Pro is set to make its way to the U.S. via AT&T, with a rumored launch date of some time in May, but we are also hearing June. 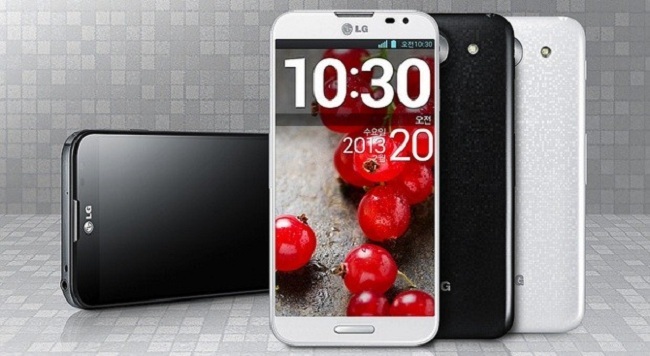 The Optimus G Pro launched in Japan with a 5″ HD display, but apparently the American variant is set to come with a 5.5″ display instead, just like last year’s Galaxy Note 2. In terms of specs, we are looking at a 5.5″ 1080p display, Snapdragon 600 processor clocked at 1.7GHz, 13MP back-facing shooter, 2GB of RAM, and a microSD slot for more storage. Keep in mind, when this device does launch, it will be going head-to-head with Samsung’s Galaxy S4, as well as HTC’s One. It’s starting to shape up to be a major battle for smartphone sales here in the U.S. during Q2. With LG on the good side of American buyers again, is anyone interested? This is one beast of a device.